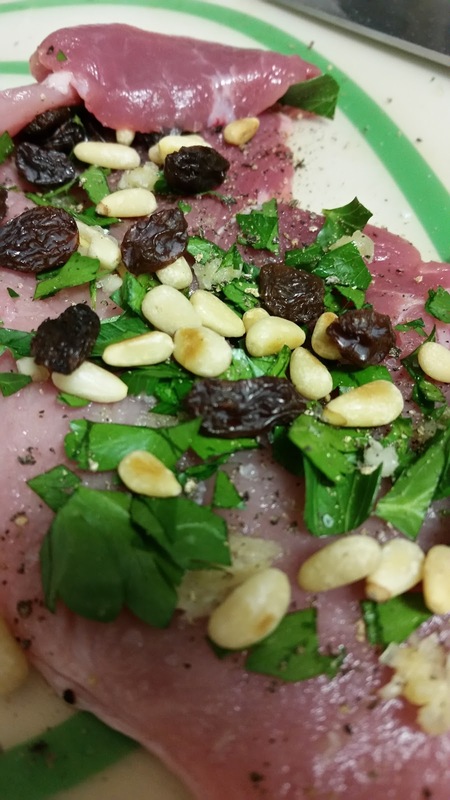 In my recipe I included some of the interesting bits from a few of the recipes I researched. For example I included rehydrated porcini mushrooms and some of their soaking liquid, some red wine vinegar, a dry red wine (zinfandel this time around), and bay leaves, raisins, pine nuts, Romano Pecorino cheese, and some sweet Italian bread.. Obviously there is plenty of extra virgin olive oil to cook with as well as salt and pepper to season everything as you go along. 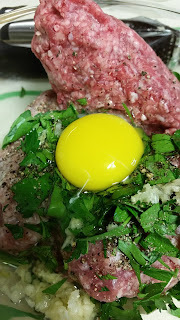 So to start I went to my local Italian supermarket Lunardi's, and picked up what I needed, I decided to go with two types of braciole, pork and beef, two links of hot and mild(with fennel) italian sausage, and a 1/3 of a pound each ground pork, veal, and beef, for meatballs. 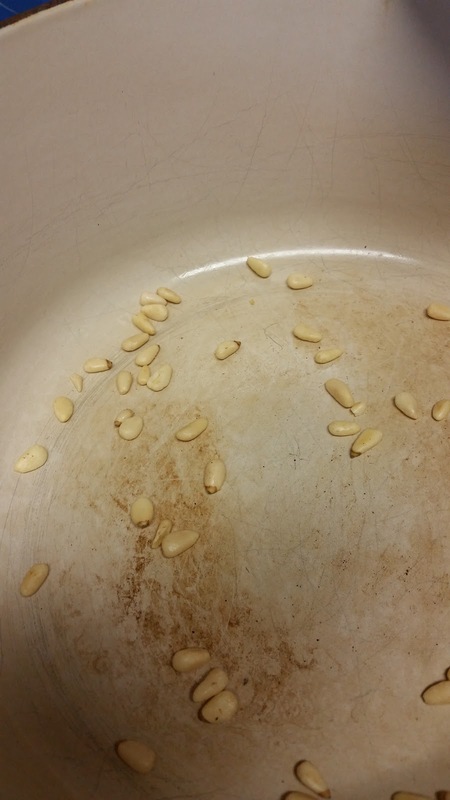 First thing I did when I got home is put on my 5 qt cast iron dutch oven and with the pot dry started roasting the pine nuts on med heat. These go pretty quick so watch them carefully, stirring with a wooden spoon so they don't burn! Once golden in color a nutting aroma is released. Go and place them to the side. This is also a good time to start soaking the dry mushrooms. All you do is place the mushrooms in a small bowl, and then cover them with the hottest water you can manage out of the tap. By the time you go to use them, they should be rehydrated and the liquid should be a deep brownish color and smell very mushroom and woodsy, and delicious in my opinion. The next step was to cover the bottom of the pot with extra virgin olive oil on med/high heat and wait for it to just start smoking. 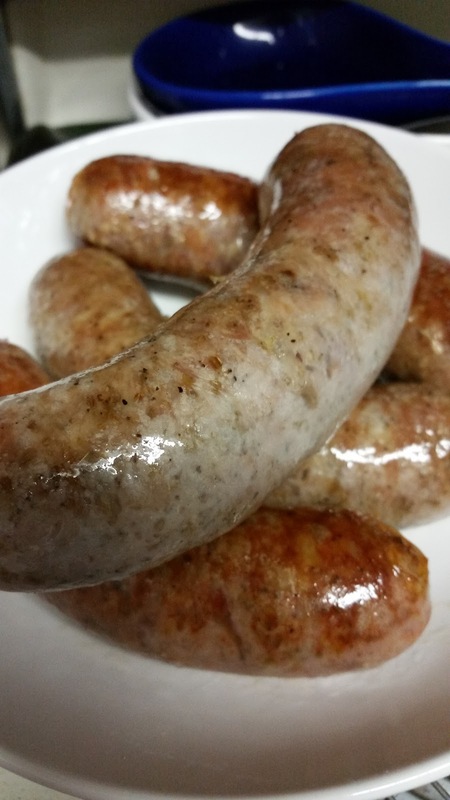 Once wisps of smoke appear, carefully place in the sausage links and sear each side until golden brown, these won't be cooked all the way through, but we will finish those in the sauce later. 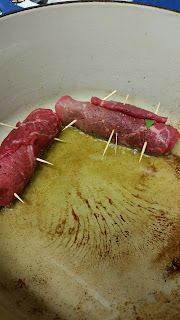 Now I turned my attention to making the braciole, which is just Italian for a jelly rolled meat snack, eh I could be wrong. 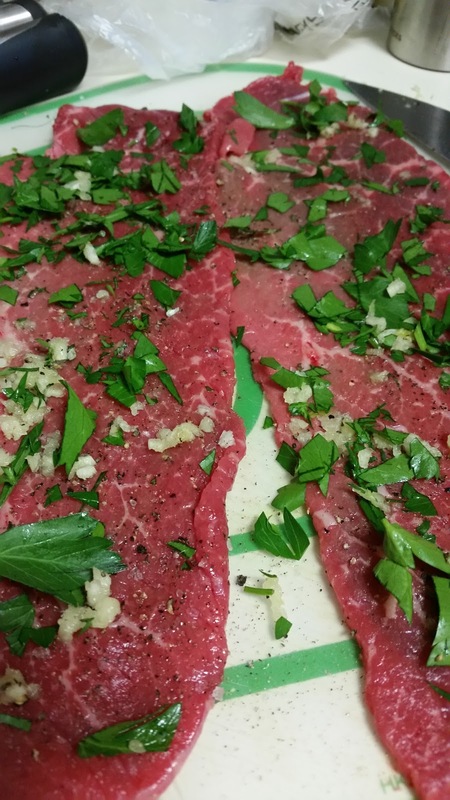 Back at Lunardi's, I had the butcher cut some pork and beef slices for me fairly thin. These were to be used to create two different kinds of braciole. The first was a beef braciole, which is super simple, all you do is season both sides with salt and pepper then smear on finely minced parsley, garlic, and grate some of the Pecorino cheese. 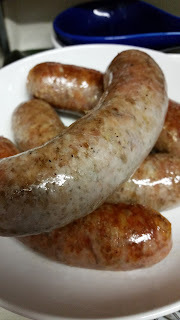 The pork slices I did a bit different. I used the same initial process, season with salt and pepper, smear minced parsley and garlic, but then I added in the pine nuts and raisins before rolling up and securing with toothpicks. You can use butcher twine or other means of securing the rolls because the last you want is your rolls unraveling while cooking! 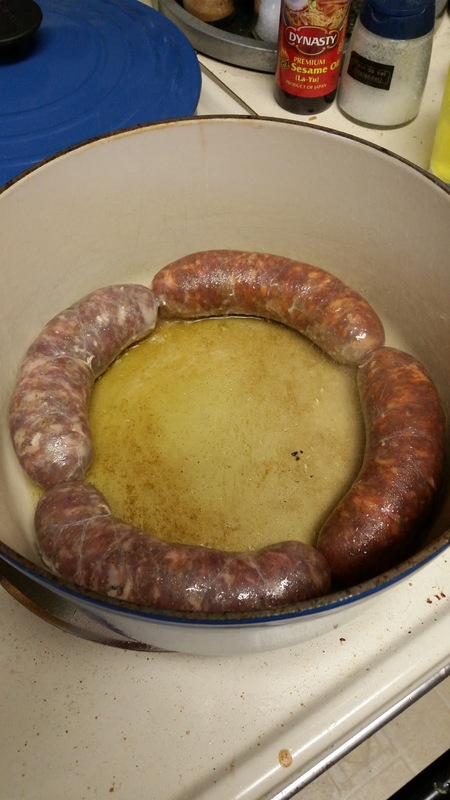 I then removed the sausage links, since they were both nicely colored on each side, and I then placed the braciole in the same pot/oil and started to sear both sides. 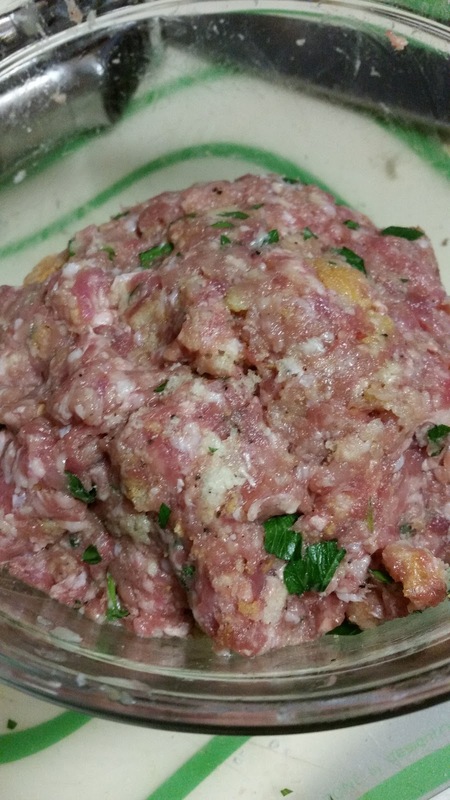 Now with the 2nd of the tri-force of meats cooking away, I focused on prep for the meat balls. As I mentioned I purchased 1/3 of a pound of each ground veal, pork, and beef. I put the three ground meats together in a bowl with some salt pepper, some of the romano cheese, garlic, along with an egg and plenty of bread crumbs. 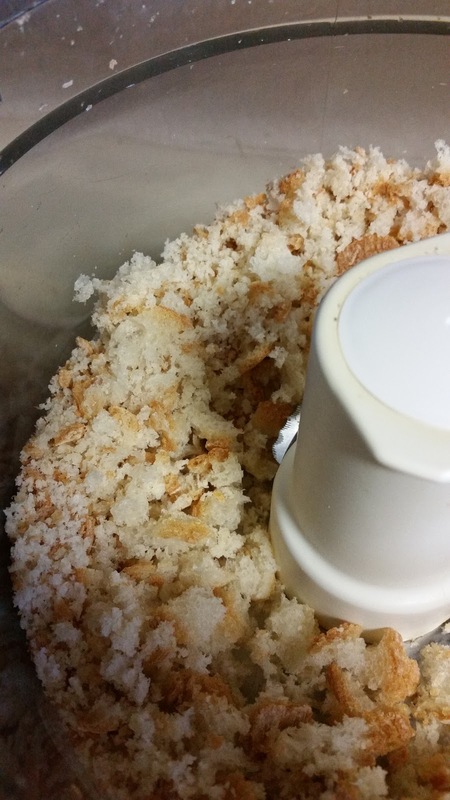 The bread crumbs I made in my food processor by pulsing the hell out of about 1/4 of a 2 ft Italian loaf/baguette. The rest of the loaf will be used for garlic bread! I kept working everything together adding in more breadcrumbs as needed until the ball of goodness wasn't really wet and yet held together on its own. 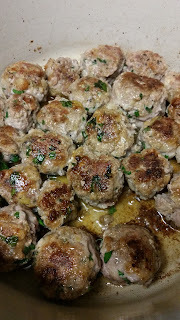 Then I fished out the braciole, now both golden brown on two sides with a nice sear, and started frying up the meatballs until they were crispy and golden on both sides. 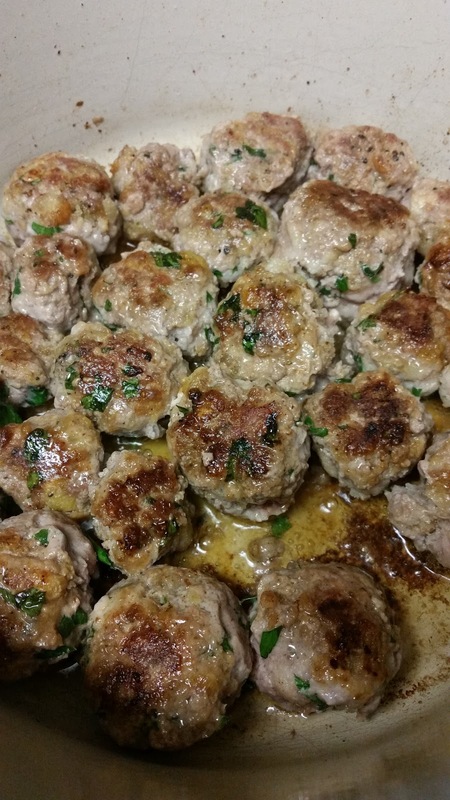 When they were done I removed the meatballs and set them to the side. 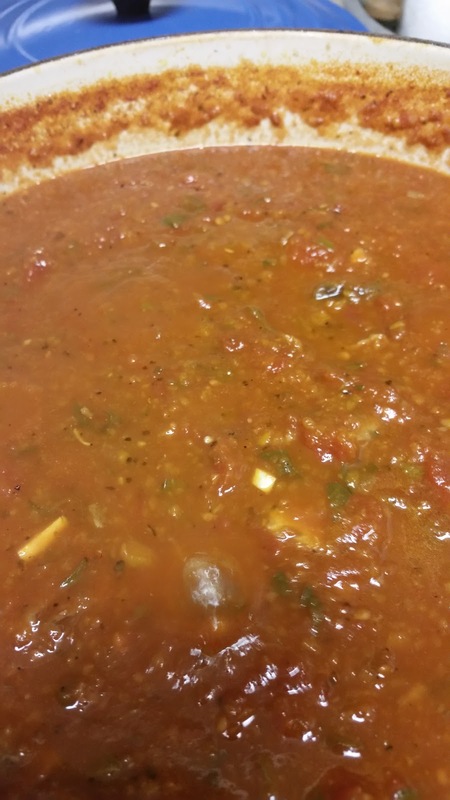 At this point the olive oil has taken on flavor from all of the meats, which helps makes this "sauce" have various levels of flavors, which is why you do it this way. You're building a tower of flavor! Sadly the next portion of the process was lost on my phone (I think I took a blurry photo and in my haste deleted the entire section. Essentially, I took three med carrot, cleaned them and then cut them into 2 in piece. I did the same for three stalks of celery, and then cut one med sized yellow onion into quarters. 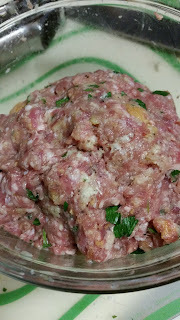 I then pulsed the hell-o-kitty out of them in my food processor so they were about the same size as minced meat would be. 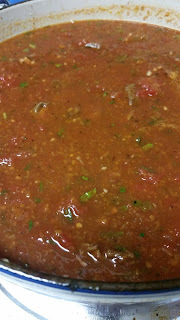 Once completed I placed the sofrito into the pot and began to fry it, you want to just slightly caramelize the sofrito by driving off the water and actually frying the veg, so it helps to salt and pepper the sofrito as it goes into the pot. 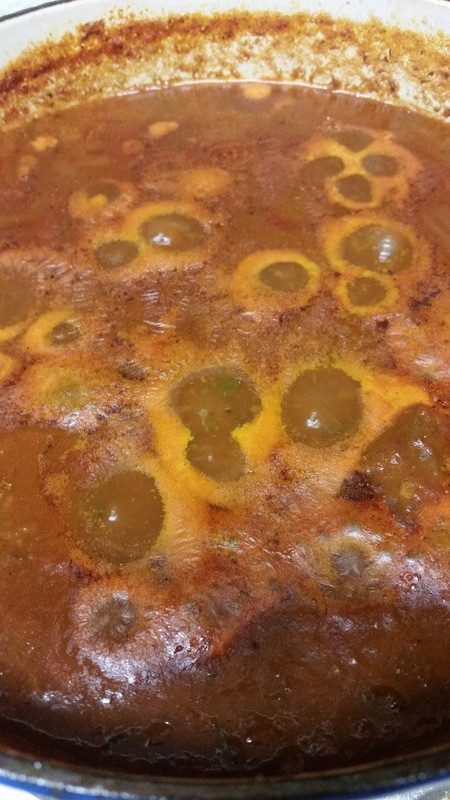 When the water had evaporated I put in the tomato paste. The acid helps deglaze the bottom of the pot a bit, to get all those tasty brown bits, then after two to four minutes, I put in about 1/4 of red wine vinegar, about a cup, cup and a half, of the dry red wine. After a minute or two of adding in the wine, I then added in then the porcini mushrooms and about half of their soaking liquid. I let this whole mix of veg and liquid reduce by about half. Now is when I put in the bay leaves(2) and poured in the two tins (28 oz.) of plum tomatoes, crushed with my bare hands! Arrrr! If needed 3/4 to 1 full can, of the 28 oz can, of water can also be added. 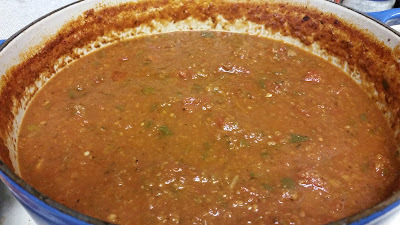 Once stirred and combined, I let the "gravy" set for a good 2 hrs, minimum at a very low, barely a simmer, stirring occasionally making sure items didn't get stuck to the bottom of the pot. You can simmer this for however long as you want, the flavors will only intensify! 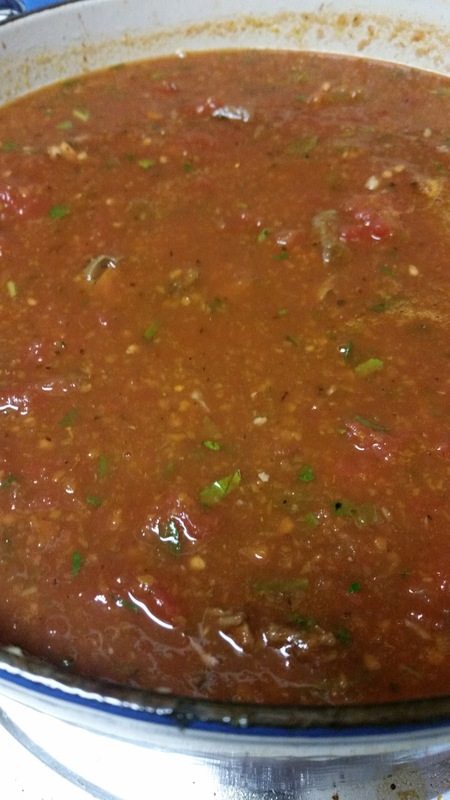 You can also leave it "chunky style" or use a stick blender to smooth things out a bit when ready to serve. To finish everything off, place in all the meats about 20 min prior to serving (or longer if you'd like) so they can finish cooking and absorb all the goodness of the gravy. 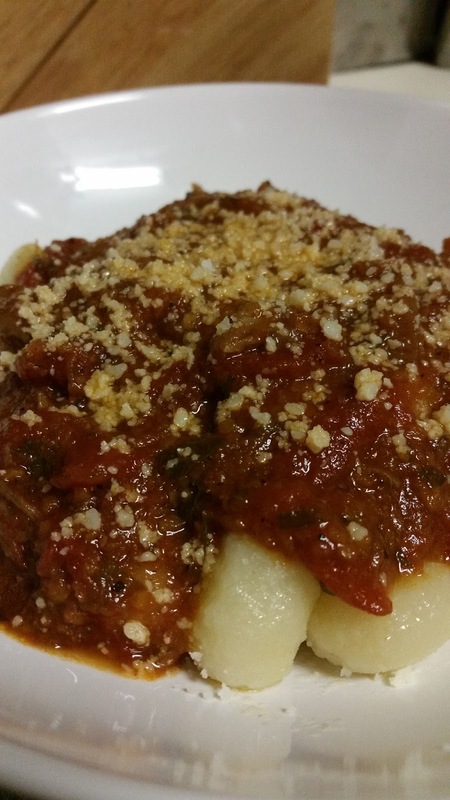 You can serve this over any pasta really, or gnocchi, like I did this evening. I also cut about six 1/4 in slices of the remainder Italian bread and placed them under the broiler to toast them up. As soon as the toast is out from the oven, while piping hot, you scrape them with a raw garlic clove, sprinkle on some finishing salt with a good amount of pepper, then a nice drizzle of really good extra virgin olive oil! This garlic bread beats the garlic/butter combo every time! Don't be fooled! Overall I was pleasantly surprised, as was my girlfriend, on how well this turned out. We now have leftovers for days. 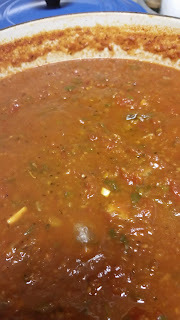 I placed three 1 quart containers of sauce in the freezer for reheating later during the week when the mood strikes! I would encourage you to try out this "process", add in your own tweaks, and make your "own" Italian Sunday Gravy!